Due to the cold weather forcast, we have cancelled youth participation. We are no longer accepting registration for children under 18. Please see below for additional information. ONLINE REGISTRATION CLOSES WEDNESDAY NOV 21st at NOON. AND ON RACE DAY FROM 8:00 - 8:30 am. Due to the cold weather forecast, we have cancelled youth and child participation. If you have already registered, you will have received an email with further details. Once again we plan to offer number pick up and in-person registration Wednesday evening Nov 21st. at JP Licks, 659 Centre Street in Jamaica Plain from 4-7 pm. HATS ARE SOLD OUT We will have some available for purchase on race day. Note! Registration for free awesome hats is limited to the first 500 registrants and will "sell out" around Nov. 1st if not before. We will have these great beanies for sale at the race for your warmth, style, and to support the great programs of the Franklin Park Coalition. New this year! Colors to choose from a snazzy cuff! 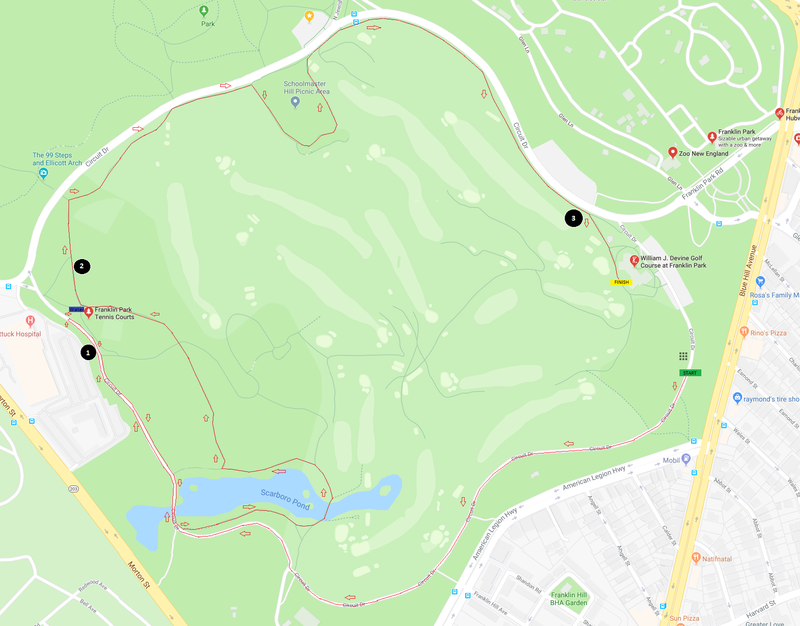 Ample parking in Franklin Park at the golf clubhouse, along Circuit Drive, in the parking lot across the street, and in the circle by the exit towards Blue Hill Ave. There is an additional parking lot .3 miles down Circuit Drive and an extra parking lot by the zoo rear entrance. The 2018 course will highlight the $5 Million pathways project recently completed through Mayor Walsh's capital plan, including a loop around beautiful Scarboro Pond! View the 2018 course map. We’ll have prizes for the male and female overall winners, age group first place winners, and for runners in the best costumes, the fastest dog, and fastest stroller at approximately 9:50 inside the clubhouse. Do you love parks and want to further support Franklin Park Coalition? After registering for the race please create and share a Parksgiving fundraiser. While it's optional to fundraise- we really appreciate your support. During this time of sharing- our friends & family will love to support the places and causes you love! In addition, there are sponsorship opportunities. Questions? Contact: TurkeyTrot@franklinparkcoalition.org or call: 617-442-4141. Kyle Zick Landscape Architecture Inc.